Get your yard and garden on at the 34th annual Spring Garden Fair Saturday and Sunday, May 5-6, at the Clackamas County Event Center in Canby. 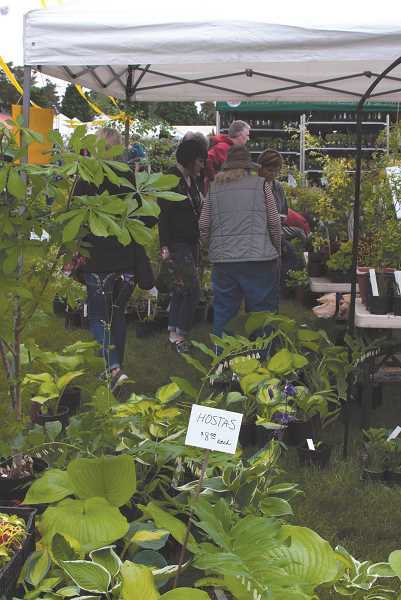 The event, put on by the Clackamas County Master Gardeners, will host more than 100 vendors with everything for the gardener. Vendors offer plants from annuals and perennials to trees and shrubs with everything in between. There will be specialty vendors with tools, garden art and compost, as well as vendors that specialize in all sorts of vegetables and herbs. The garden fair runs from 9 a.m. to 5 p.m. on Saturday and 9 a.m. to 4 p.m. Sunday. Admission is $5 with children under age 16 free. Parking is free as well. > Award winning 10-Minute University returns with short classes on gardening; Ask a Master Gardener booths in two locations to answer gardening questions; Free pH soil testing in 4-H Hall both days along with displays from local organizations and Free Children's Activities. The Greater Portland Iris Society will hold its annual Early Show on Sunday, May 6, on the back porch of the Main Pavilion. >The Potting Station has great deals on containers (they will even pot up your purchases before you leave). Each year, local student volunteer to work the Plant Taxi's, towing for tips. The free plant check will hold purchases. >Every year there is a garden fair raffle with dozens of prizes each hour, a silent auction featuring new plant Introductions and favorites from local growers, as well as a food court and Coffee Thyme for taking a break with covered or indoor seating available. Clackamas County Master Gardeners are volunteers trained by Oregon State University in the science of gardening. Proceeds fund horticulture scholarships for students at Clackamas Community College as well as community grants and free educational programs. Find out more about our event at www.SpringGardenFair.org or https://www.facebook.com/SpringGardenFair.